I’ve spent a long time being intimidated by dumplings. That such cute, juicy little morsels can evoke such fear is quite absurd. 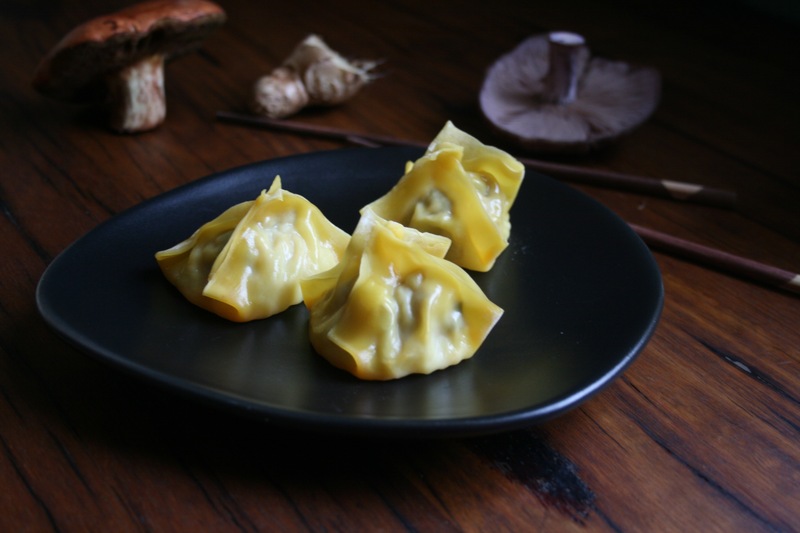 But the first time you attempt making dumplings at home, you realise not just how easy it is, but also, the endless possibilities – you can put nearly anything into those little wrappers! I made these last night because we have 2 large basketfuls of mushrooms we foraged over the weekend, so my creativity is being seriously tested on the mushroom front this week. My husband declared these ‘the best dumplings he’s ever had’. Overkill? Perhaps, but they were pretty good. And easy. Here’s how I made them – these quantities will serve 4 hungry people (it’ll make about 32 dumplings). First, if you’re going to the effort of making these dumplings, then invest in some tasty mushrooms, not the flavourless ‘button’ ones you find in the supermarket. Your local grocer will likely have some more interesting varieties. I used pine mushrooms (also called saffron milk caps) for these dumplings. Finely chop the mushrooms (a paper bag full), and throw them into a large pan with a knob of butter. Remember that this mixture will be going into small dumplings, so chop the ingredients accordingly. Cook the mushies on medium heat for about 5 minutes. Whilst they’re cooking, chop 2 spring onions, 2 garlic cloves (you could mince these) and grate some fresh ginger (to make about 2 tablespoons of grated ginger). Add these ingredients to the pan. You may also need to splash some water into the pan if the mushrooms are drying out. Stir and keep cooking for another 5 minutes. Keep splashing in water as the mixture dries out – you want it to be moist. Once cooked, turn off heat and add a few tablespoons of light soy sauce and about a tablespoon of sesame oil. Stir and leave to cool. Once cool, add the mixture to a mixing bowl with one egg and 500g of good quality pork mince (please make sure you are purchasing from an ethical source where the pigs are properly treated). Add some freshly ground black pepper. Mix together well with your hands. Lay out the wonton wrappers on the kitchen bench and spoon in the mixture. Brush water around the edges of the wonton wrapper and fold the sides together. There are many ways of folding the wrapper – I just fold all 4 corners in at the top and pinch them together. Then I pinch the seams together. You may need to experiment with the first few to make sure you’re getting the right amount of filling – you don’t want the dumplings to be so full they’re bursting, but you also don’t want too little in the dumplings. If you have only very small amounts of mixture in the dumplings, the amount of wonton wrapper folded at the top will be quite thick so will take longer to cook and therefore be less juicy overall. Place in a steaming basket over a wok with simmering water (or steam oven if you’re lucky enough to have one like me) and steam for 20 minutes. Serve with a sauce of sesame oil, light soy sauce (and chilli for the adults). Love it! You definitely make it sound easy. Will try this week…..
Would love to hear the result Em!